Chris Boyer with Noodle, and Ric Payne with Jack, on a recent afternoon at Fort Logan National Cemetery with the Honor Bell. We’ve recently had a couple of four-legged friends join us as honorary Bell Guard members. Please meet Noodle and Jack, and their humans, Chris and Ric. 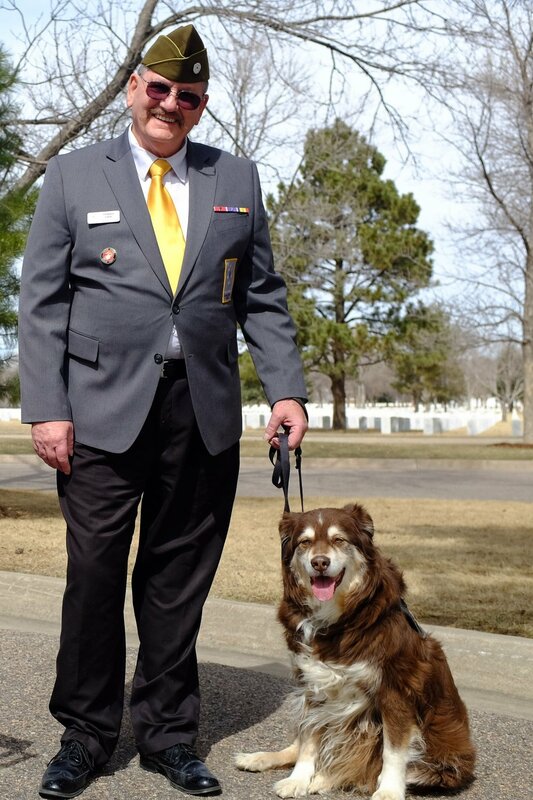 For the last seven months, Noodle has been a constant companion to Chris Boyer, a Marine veteran and volunteer in the Honor Bell Guard. The two-year old boxer mix makes Chris laugh, lowers his anxiety and depression, gives hugs and is a great cuddler. Chris says Noodle is a wonderful listener. It's hard to summarize the difference Noodle has made in his life, but he makes it easier to go out and engage without anxiety. Noodle's favorite treats are hot dogs and cheese. He was rescued from a kill shelter and graduated as a service dog from Freedom Service Dogs. Ric Payne, another Marine vet, has a similar bond with his ten year-old Australian shepherd, Jack. Jack fell out of a pickup truck as a pup, and was badly injured. He wound up at the shelter where Ric was volunteering and they became fast friends. Trained as a PTS service dog, Jack has become Ric's best friend and constant companion. He helps Ric focus and deal with crowds. Jack can also tell when Ric’s nightmares are coming on, and he crawls into bed with Ric to wake him up before the nightmares begin. Ric and Jack are inseparable. Jack's favorite snack is roasted beef lung tips (yum!). Both Noodle and Jack were rescued, and each of them in turn rescued their Marine.